Many believe that "sanding is sanding." That is; all you need to do is grab a piece of sandpaper and start rubbing, no matter what the surface might be that you are trying to smooth. This isn't true, and there are a number of ways to sand incorrectly. Let us make the subject a little clearer. Whether the surface you are sanding is wood, metal, drywall, plastic, etc., the purpose of sanding is to get the visible layer as consistently smooth as possible. Doing so prepares the surface for a lovely finish or deep polish. To accomplish this requires the right sandpaper and the right application. We won't go into types of sandpaper in this article, since there are many to enumerate and lots of comparisons between them. Suffice to say that you should always use the best quality paper for each job, because high quality papers last longer and require less effort. We keep our sandpaper in homemade racks, sorted by coarseness or grit and by type. This makes it easy to get to and always lets you know when you're running out. There are a few basic rules to follow when it comes to grit size. First, the greater the material that must be removed from the surface, he coarser the grit should be. Second, a smooth surface is only accomplished with fine grit, so coarse sanding must be followed up by gradually finer sandings. Okay, let's sand some wood. Wood grows in grain patterns, running vertically up the tree. When you sand wood you should always sand in the direction of the grain, not against it. Sanding across grain causes deep scratches that will show up under the finish. Hard woods require coarser sandpapers than soft woods, but you should always use a sanding block (either a commercially available one or a piece of scrap wood, around which you've wrapped the paper) or pad-type electric sander. Doing so keeps you from “scalloping” the wood. This is what happens when your fingers press into the paper and you dig deeper into softer layers than the harder grain. Notice how the sandpaper is being pushed along with the grain. If you're restoring a car you will be sanding metal. Naturally, the metal surface is pretty consistently hard so it's not likely you'll scallop the surface unless there is plastic filler on it. However, you don't want to sand metal in one single direction because it creates scratches that are hard to fill with primer and paint. Every imperfection left under the finish coat will become quite noticeable when the shiny color is applied, so metal must be sanded carefully. Let the sand paper do the work. Don't push on the sandpaper; a light touch is all that's required. 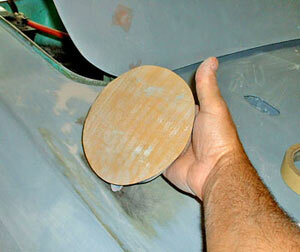 When dry sanding, to extend the life of the paper, occasionally tap the paper to remove some of the dust clogging it. When wet sanding, use plenty of water, using short strokes and light pressure. Never allow the surface to dry during the wet sanding process and don't let paint residue build up on the paper. Periodically sponge off the surface and wipe it dry with a squeegee so that you can check your progress. Do not wet-sand plastic body filler. 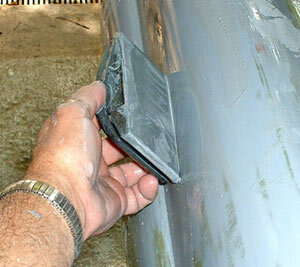 The plastic filler can absorb and hold moisture and cause paint problems later. The wet/dry paper is held onto a rubber sanding block. This makes it much easier to keep the surface free from scalloping. Don't succumb to the temptation to sand in one spot. Sand over a broad area to maintain a level surface, even though a particularly stubborn spot might persist. 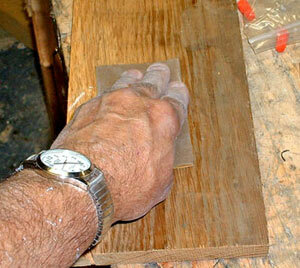 When sanding a flat surface using a sanding block and stop short of any curved surfaces. Switch to a foam pad for sanding the curved areas. Circular foam pads are available that accept adhesive-backed paper. These are great for sanding contoured surfaces, whether the material is wood or metal. 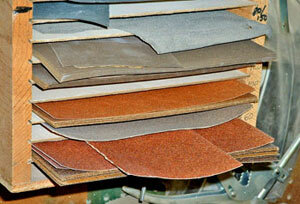 Old material left on metal can be sanded with coarse papers, such as 80 to 150 grit. However, scratches left from those papers must be sanded out with finer paper (220 to 400 grit) before primer and intermediate coats are applied. Final color coats shouldn't be applied before the fully-prepped car is sanded with 600 or finer paper, since fine scratches will show up otherwise.